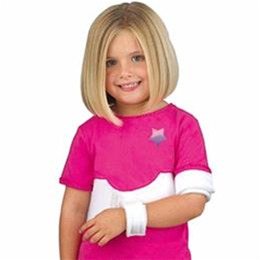 Elastic Shoulder Immobilizer :: BRACES & SUPPORT :: FLA Orthopedics Inc.
FLA Orthopedics Pediatric Shoulder Immobilizer is ideal for use on infants, kids, and children for shoulder immobilization and to reduce abduction and arm rotation. The pediatric immobilizer is made of a soft elastic material and is lightweight with a low profile. FLA's shoulder and arm immobilizer features loop lock closures for easy application and fits either the right or left arm. White. Available in 2 sizes: Infant and Pediatric. One elastic shoulder immobilizer per package.